The ship didn't last long and was sunken right off the coast of Cape May Point (Sunset Beach) thanks to a coastal storm on June 8th, 1926. Over the years...the concrete ship has become less and less visible from the beach. Every time we go to see it...we see a little bit less. What you see in my photo...is all that is left sticking up out of the water and I captured this shot during low tide. The tides are not as HIGH and LOW here on this beach as they are on the Atlantic Ocean side of Cape May. When you visit Sunset Beach you'll find all kinds of things to see and do. 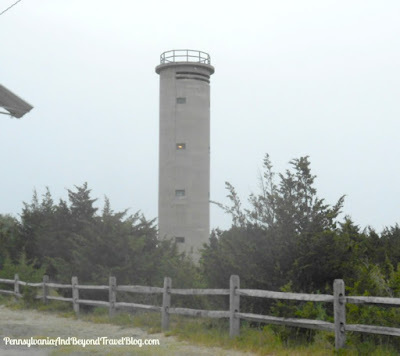 The World War II Lookout Tower (shown in bottom photo, picture taken during a thunderstorm) is here and you can walk around those grounds for free. If you want to tour the inside of the tower, you'll have to pay a small fee to do that. You'll also find three gift shops & souvenir stores here at Sunset Beach. The largest one is the one I like to shop at to pick up gifts, souvenirs, beach tees, jewelry and seashells for my collection. The second store is more like a rock shop that sells rock & mineral specimens, outdoor yard decor, jewelry and some gifts. The third and final store sells beach clothing and towels. If you're looking for something to eat or drink, you can find that at the Sunset Beach Grille which offers some of your standard hot & cold sandwiches, pizza and drinks. Their prices are decent but the food is nothing to rave about it. Good but not delicious. We love miniature golf, so every time we are down here we like to play a round at the Sunset Beach Mini Golf. They have a beautifully landscaped 18-hole mini golf course that is affordably priced. It's really a lot of fun to play and you get some gorgeous ocean & bay views of the water & beach as you play. My family loves this course & it's their favorite one down in Cape May. 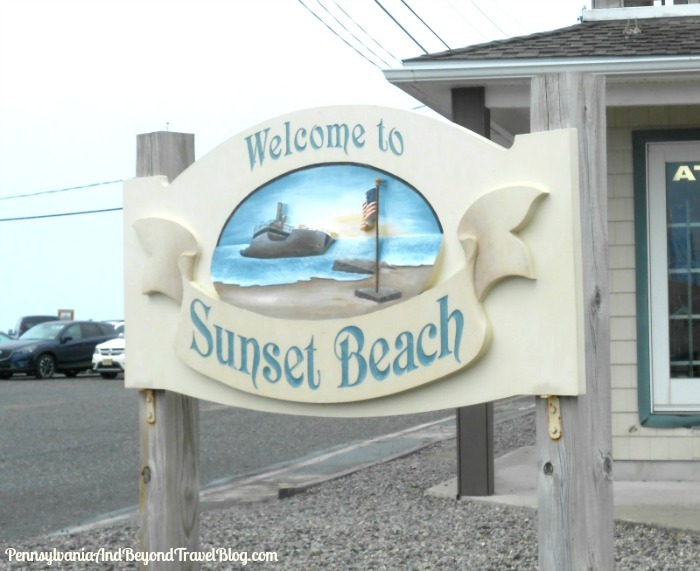 Sunset Beach is a must-visit place if you're heading down to Stone Harbor, Wildwood, Diamond Beach and/or Cape May in New Jersey. You can park for free in their parking lot and walk around to sight-see and do a little shopping. I wish you could see more of the sunken ship, but the beach and surrounding area is still beautiful.